A brave 8-year-old has been declared cancer free after being given a unique surprise that saw him undertake his treatment dressed as somewhat of a SUPERHERO. 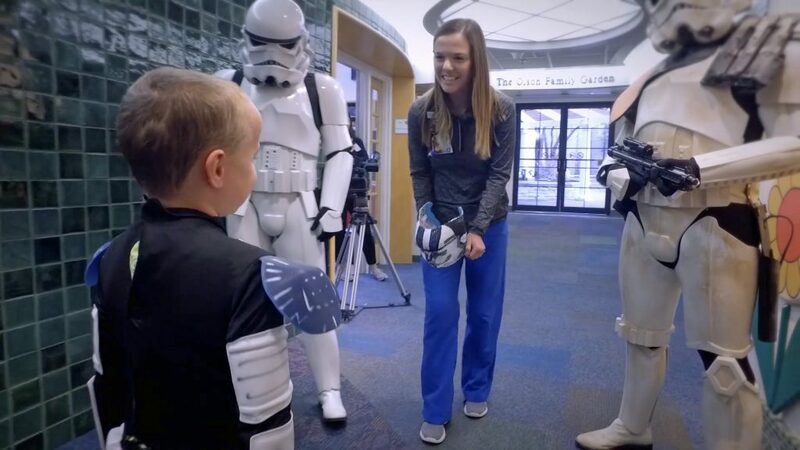 Evan Cornett, a brain cancer patient, was given a major uplift in his fight against the disease when he was presented with a radiation mask designed as his favorite Star Wars characters, helping to ease the anxiety of the process. Evan Cornett’s doctors at St Louis Children’s Hospital set up a new program as a way to help ease anxiety and fear for children going through proton beam therapy and make them feel special. In Evan’s case, that meant dressing as a clone trooper. So far, staff at the hospital have transformed the often unappealing radiation masks into popular characters such as Stormtroopers, Marvel Comic heroes, Disney princesses and members from Paw Patrol. 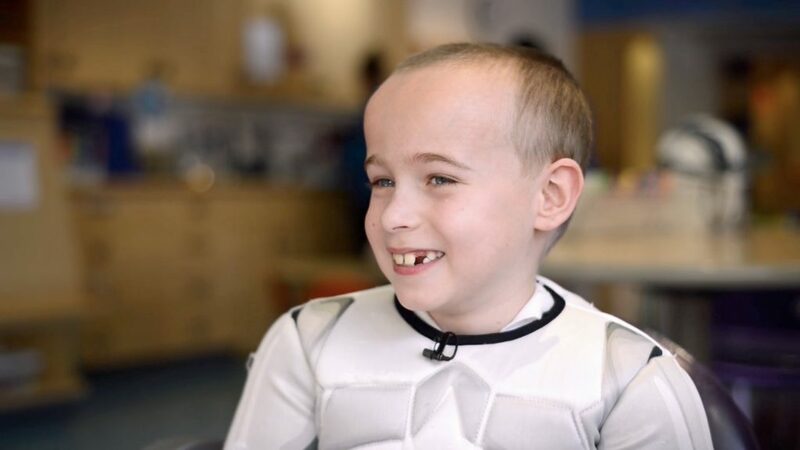 Dressed up as Commander Appo and wearing a beaming smile upon his face, brave Evan said, “You look very familiar” to the Stormtroopers who were stood behind Hannah moments before receiving his new mask. The moment was filmed in St Louis, Missouri, USA, in earlier in the year, and Evan was given the all-clear in March, 2018. Child life specialist Hannah Heimos started the project especially for the 8-year-old and gained the support of two members of staff in the process. 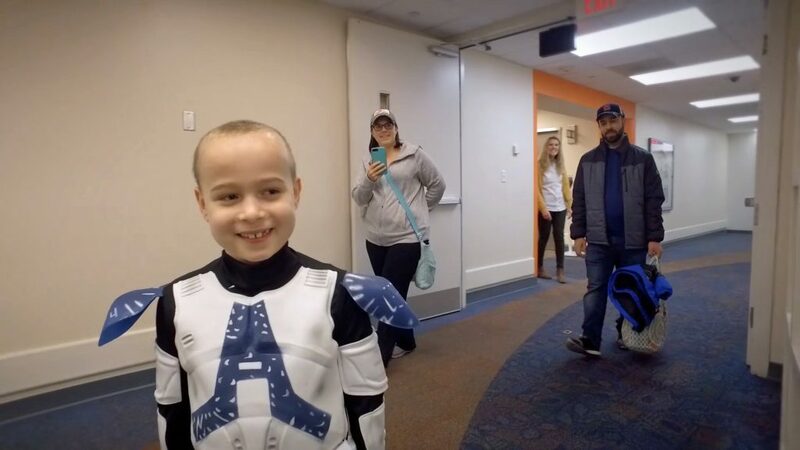 Dressed up as the troopers, they presented Evan with the mask and escorted him to the treatment wing of the hospital, the Imperial March song echoing in the background. After being placed on the radiation table and fitted with his new mask, Evan gave a thumbs up to the camera moments before his 30-day treatment began. The genius behind the thoughtful idea, Hannah Heimos, said: “I think it gives the patience more choice during treatment, they can choose who they identify themselves as, whether it’s a superhero or a princess – it gives them more control, it also makes it more fun for them, if they’re obsessed with that character, they can act like them for the duration of their treatment. “Evan is a huge Star Wars fan, he has been teaching me a lot about Star Wars but I still have so much more to learn! Emily Cornett, Evan’s mother, said: “I think it’s pretty neat. It will help kids going through treatment be more relaxed and makes it more fun for them. Dr Stephanie Perkins, the radiation oncologist at St Louis Children’s Hospital, said: “Proton beam therapy is a type of radiation that is only available in St Louis – it’s the type of radiation that gives us more control on where the radiation exits the body, so it’s really important especially for children and especially for brain tumors as we want to limit radiation to a developing brain. We’re able to control that better with proton therapy. “The Cornetts are the most amazing family. Their approach to his diagnosis has helped Evan have less anxiety about whats going on over the course of his treatment.